First, of course, the Seahawks traded down with the Pittsburgh Steelers. Then they got the defensive line reinforcements they desperately needed with their lone pick on Day 2 of the NFL draft. Instead of making any kind of big move on the second day of the NFL Draft, the Seahawks instead added a big mover. On a day that many may have regarded as a quasi-deadline for the future of Earl Thomas, Seattle made no significant trade other than to pull off a deal with the Steelers to move down three spots in the third round and pick up an extra seventh-round pick. 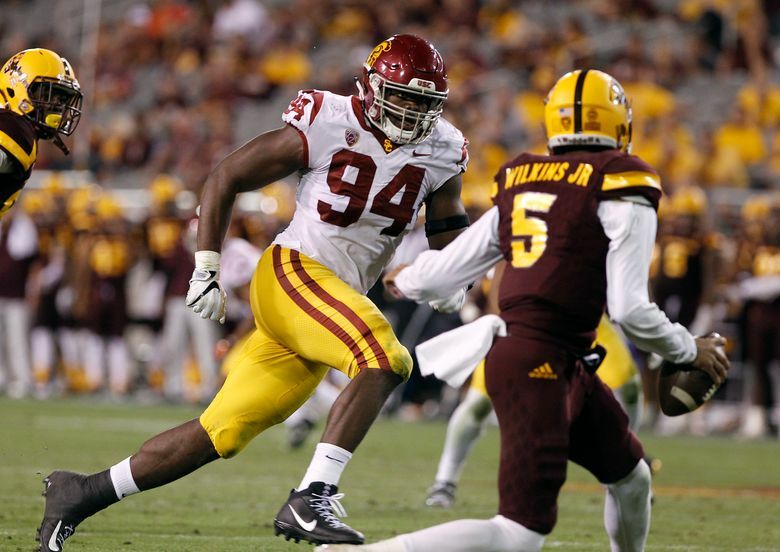 They used that third-rounder, number 79 overall, to select USC defensive lineman Rasheem Green, a 6-4, 275-pounder who will turn 21 on May 15 and whom coach Pete Carroll says thinks will gain 15-20 pounds over the next few years. John Schneider and Pete Carroll break down Rasheem Green’s strengths and look forward to Saturday, when the Seahawks have eight picks in the final four rounds of the NFL Draft. Green will help the Seahawks replenish a defensive line that has seen significant turnover over the past year, projected to play a role similar to that of Michael Bennett, who was traded to the Eagles last March. “Gonna play him at five-tech at defensive end and use him as an inside rusher as well in nickel situations,’’ said Carroll, describing exactly the role played by Bennett the last five years and that the team also had ticketed for Malik McDowell, the team’s first pick in the draft in 2017 who has yet to play due to injuries suffered in an ATV accident and could soon be waived. But if the Seahawks may move Green around some, Thomas is staying put. Many around the league had speculated that if Thomas were to be traded it would happen on Friday, when the second and third rounds of the draft were held, the thinking being that Seattle would want at least a second-round pick in any package. Trade rumors have swirled around Thomas since last season because he has made it clear he would like a new contract — his current one ends following the 2018 season. But while general manager John Schneider acknowledged that the team fielded lots of calls on Thomas in recent weeks — including, he said, on Friday — the team insisted nothing was ever close to happening. In fact, several national reports suggested there were some significant talks between the Seahawks and Dallas — the team long-regarded as the most-serious suitor for Thomas given his obvious desire to play there someday and the Cowboys’ need for a safety. But Schneider said talking to teams was just the team doing its due diligence. “We wouldn’t be doing our jobs if we didn’t,” he said. But the day ended with Thomas still a Seahawk and the team insisting there’s no reason to further doubt Thomas’ place on the Seattle toster in 2018. The long-term future for Thomas remains uncertain, though, as Thomas is thought to want a contract that could make him the highest-paid safety in the NFL, possibly topping $14 million a season. He makes $10 million on his current deal. But indications are the team isn’t worried about Thomas playing next season without an extension and willing to ride it out and see what happens, ruling out no possible scenarios. Many also figured the Seahawks might try to do something to move up from 76 or maybe make a bigger move to acquire more picks. But Schneider said the team didn’t have any serious discussions about moving into the second round and instead the Seahawks did not make a pick in that round for the first time since 2011. Schneider said having to wait from 27 — -where Seattle on Thursday picked running back Rashaad Penny — to 79 was frustrating. “They (names of players) just sat there coming off like this ‘see you guys. Look forward to playing against you,’’’ he joked. But the trade with the Steelers gave Seattle an extra seventh-rounder, at 220, and eight in the final four rounds, which begin Saturday at 9 a.m.
Barring any trades, Seattle’s next pick is 120 of the fourth round. Other picks are: 141 (fifth), 146 (fifth), 156 (fifth), 168 (fifth), 186 (sixth), 220 (seventh) and 226 (seventh). But on Friday, they were happy enough with what they got in Green. A five-star recruit at USC out of Serra High School in Gardena, Calif., Green overcame a speech impediment as a child and then suffered an ACL injury in high school in November, 2014. But he rebounded from the knee injury to key USC’s defensive line the last two seasons, recording 10 sacks last year, before declaring early for the draft with a year of eligibility remaining. Some thought Green could have maybe gone in the first round. He slid to the third, apparently due to concern about the knee following what was termed a “wavy’’ MRI at the Combine. Seattle brought Green in for a private visit before the draft, however, and did its own MRI and concluded the knee is stable. On a day they also made clear they won’t be saying goodbye to Thomas.